The addition of lestaurtinib to first-line standard chemotherapy produced no overall clinical benefit. Lestaurtinib is a tyrosine kinase inhibitor of FLT3, JAK2, TrkA, TrkB, and TrkC. Because the clinical benefit of adding FLT3-directed small molecule therapy to standard frontline chemotherapy in AML has not been established, researchers evaluated the efficacy of lestaurtinib in this treatment setting. As part of the UK AML15 (ISRCTN Registry Identifier: ISRCTN17161961) and AML17 trials (ISRCTN Registry Identifier: ISRCTN55675535), researchers enrolled 500 patients previously-untreated AML and confirmed FLT3-activating mutations who were mostly younger than 60 years. Of those, 74% had FLT3-ITD mutations, 23% had FLT3-TKD point mutations, and 2% had both types. 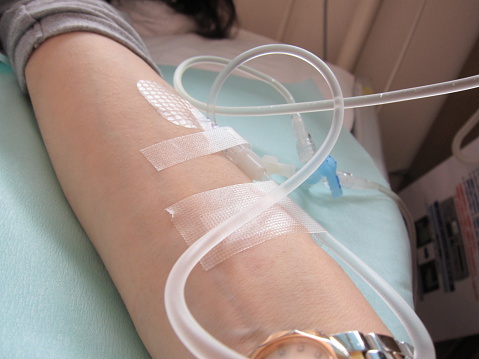 Participants were randomly assigned to receive 4 cycles of induction and consolidation chemotherapy with or without oral lestaurtinib, which was initiated 2 days after completing chemotherapy. There was no significant difference in 5-year overall survival (hazard ratio, 0.90; 95% CI, 0.70-1.15; P = .3) or 5-year relapse-free survival (hazard ratio, 0.88; 95% CI, 0.69-1.12; P = .3) between the 2 treatment arms. Exploratory subgroup analyses suggested that lestaurtinib may confer a survival advantage to patients receiving concomitant azole anti-fungal prophylactic therapy and gemtuzumab ozogamicin with the first course of chemotherapy. Investigators also observed lower rates of relapse and improved overall survival among patients who achieved sustained levels of FLT3 inhibitory activity, potentially warranting continued evaluation of FLT3-directed therapy with first-line AML treatment.